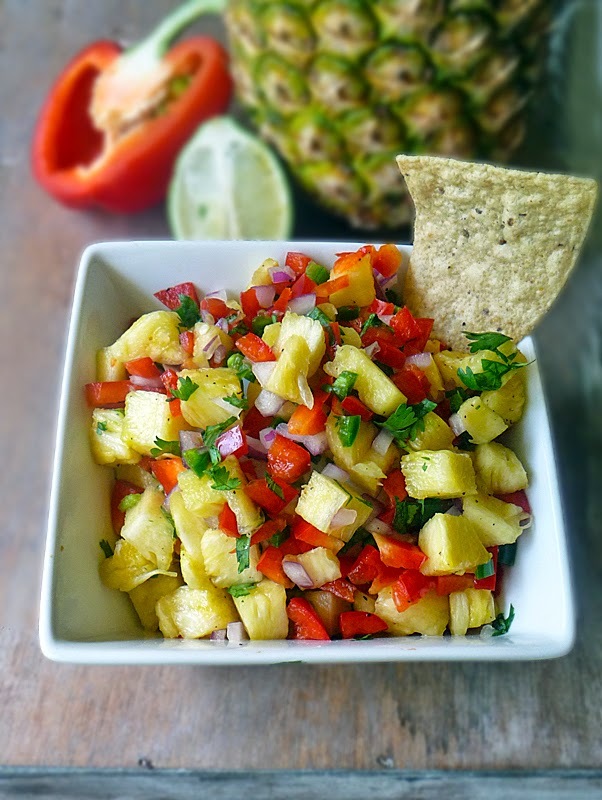 Sweet and Spicy Pineapple Salsa makes just about everything better! It's true y'all! There is just something about the sweet and spicy together that satisfies every craving I have all at once! Well, except for chocolate, because there is no substitute for chocolate! Right?!! This fruity salsa goes great with some salty tortilla chips and a comfy couch <wink>, but topping fish, chicken or even pork with a sweet and spicy fruit salsa is an easy way to turn a plain dinner into a fabulous gourmet meal! 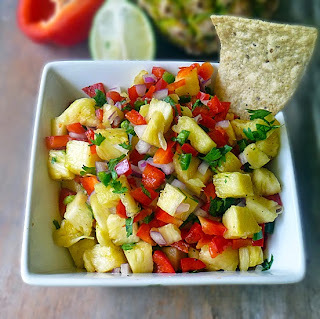 This Pineapple Salsa recipe is basically the same as my Mango Salsa, only different because it has pineapple (of course), and I left the avocado out. Don't get me wrong, avocado would be amazing in this salsa, but I left it out because the day I was making this recipe all the avocados at the store were like concrete! Those babies needed a couple more days before they could be used in anything! My cravings could not wait a couple days, so this salsa is avocado free! Feel free to add some! You won't be disappointed either way! As I typically do, I encourage you to make this your own. Taste, taste, taste as you go and adjust the flavors to your liking. Don't get locked into a recipe and feel you have to make it exactly as I say! I promise the recipe police will not come knocking on your door if you change it up a bit! We all have different likes and dislikes and some of you may not be able to handle the heat from an entire jalapeno or maybe you need even more heat!! It's okay! 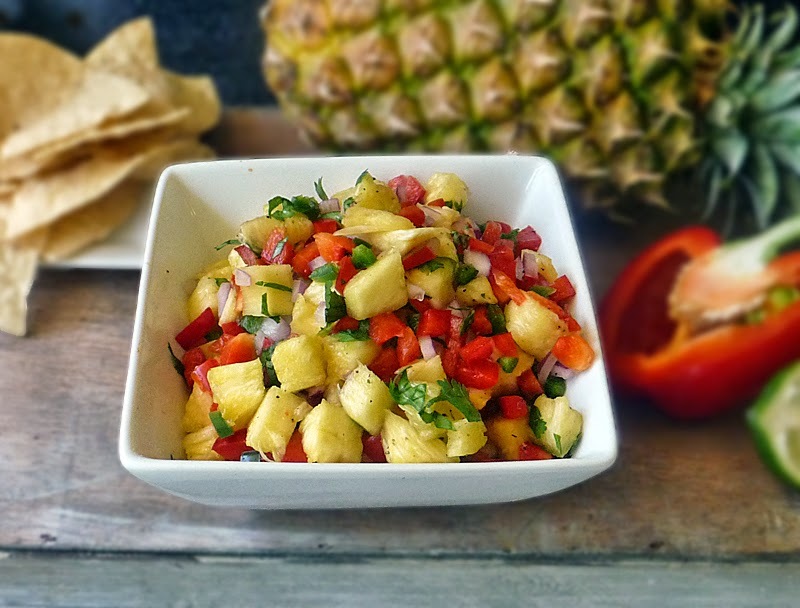 In a bowl, combine 1 heaping cup of freshly diced pineapple, 1/2 diced red bell pepper, 2 tablespoons minced red onion, 1 tablespoon chopped fresh cilantro, 1 seeded and minced jalapeno, and the juice of 1/2 a lime. Gently toss it together and give it a taste. Now add a pinch of salt and taste it again. Notice how just a little salt enhances the flavor. Add more salt if needed, tasting after each addition. Be careful not to add too much. The more you taste after each addition you will get better at knowing just how much salt is needed. Sometimes you'll put too much, but it's all part of the learning experience. Add a small pinch of pepper and give it a taste. Refrigerate until ready to use. The flavors will enhance after spending some time together in the refrigerator, so it is always best if you can make this up early in the day. Enjoy! Follow Life Tastes Good's board Life Tastes Good: Appetizers on Pinterest. This looks absolutely wonderful, I'll have to try it soon!